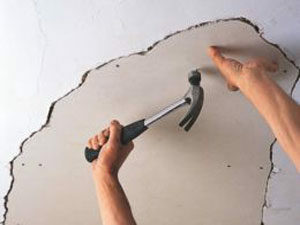 Our professional plasterers can manage anything, from mending and plastering a tiny hole or a plasterboard setup, to full house re-skims. A1 Performance Ceilings can offer expertise in all plastering and gyprock install or associated features, including house renovations, extensions, upkeep, repairs, and so on. We supply very competitive prices & a high level of customer satisfaction in today’s marketplace. Whether you have a collapsed or sagging ceiling, require a Gyprock repair, render repair or you want a wall removed or installed, we can certainly help you. We pride ourselves in our quality work; ensuring high client satisfaction and a top notch job each and every time! We specialize in small to moderate jobs. For those who are in process of a new renovation, Garage or loft conversion, water damage repairs, restoring old cornices or have a tiny hole in the wall then please call to arrange a free quote. We love this type of work and would be happy to provide you with a great price and a superb job well done.